Learn to make iOS apps even if you have absolutely no programming experience. This hands-on book takes you from idea to App Store, using real-world examples&#8212;such as driving a car or eating at a restaurant&#8212;to teach programming and app development. You&#8217;ll learn concepts through clear, concise, jargon-free language. 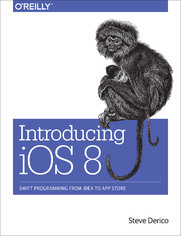 This book focuses on Apple&#8217;s new programming language, Swift. Each lesson is divided into two parts: the lecture portion explains the terms and concepts through examples, and the exercise portion helps you apply these concepts while building real-world apps, like a tip calculator. Learn how to think differently&#8212;and see the world from a whole new perspective.